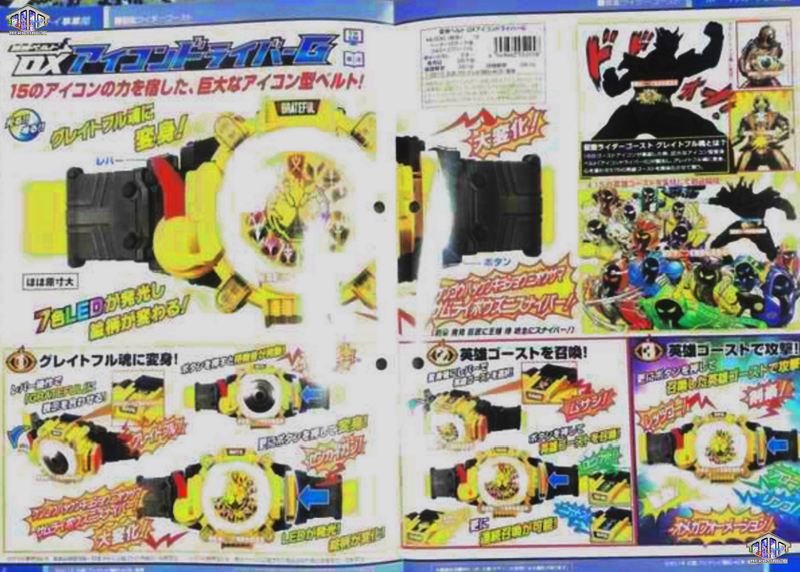 Recently announced from a toy catalog listing, here's our first look at Kamen Rider Ghost's mid-season power-up item, the Eyecon Driver G.
This new Driver that will give Ghost the power to access his power-up form, the Grateful Soul Form (silhouetted in the image) , is a large golden Eyecon that is lined with all the Heroic Ghost's symbols with the Grateful Soul symbol at the middle. Just a quick opinion: they should have let Ghost wear this from the start. It's pretty decent looking than that Ghost Driver. Just what a belt should look like. 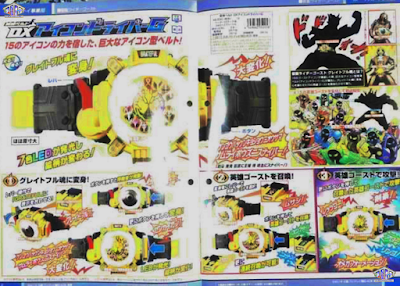 The DX Eyecon Driver will be released in March 2016. But will we be able to put eye ins in it anymore? That's a big problem for a gimmick based toy line if you can't. I honestly prefer this being an upgrade rather than his default belt. The gold and white makes me feel like he's going from being a normal ghost to something more. Makes me think of an angel or something. His normal belt works for a GHOST but this feels like something you'd see on a higher ranking spirit. I think the author means more the belt mold (words fail here), than the actual belt itself. I agree as well. The default belt is so big and clunky, really dislike it's design. This power-up belt has a more traditional/less gimmicky design. In any case, when this form debuts, the old belt will see little to no use anyway. I think one thing to note here: Spectre is likely still going to use HIS Ghost Driver after this.